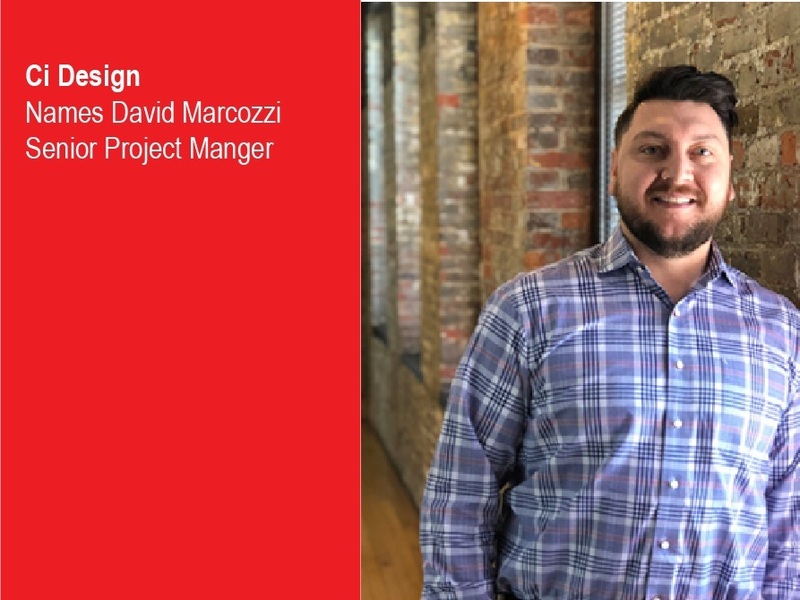 BALTIMORE (January 15, 2019) - Award-winning international architectural design firm CI Design has named David Marcozzi senior project manager, it was announced today. Marcozzi, who will be based out of CI's Baltimore headquarters, will bring extensive experience in hospitality, multifamily and mixed-use development to the firm, expanding its global practice. "Creating innovative, integrated projects that become special places for their users is the heart of CI Design's mission," said John Larsen, CI Design president. "David's multidisciplinary work, which combines knowledge of architecture, landscaping, urban planning and interiors, under-standing of cultural biases, and team leadership fits right into that philosophy. We're delighted to welcome him to the firm." Prior to joining CI Design, Marcozzi spent 13years with FILLAT+ Architecture, most recently serving as an associate principal and director of the Baltimore office. His projects, nationally and internationally, have included mixed-use complexes incorporating retail, entertainment, hospitality and residential components. Among his most notable projects are: 400 East Pratt Street in Baltimore, the Moxy Hotel in Washington, D.C. and The L on Liberty in Baltimore. For more than 25 years, CI Design's team has offered innovative, sustainable and value-creating design solutions for mixed-use, retail, entertainment, hospitality, industrial, residential, workplace and specialty design projects. Its projects include: the conversion and expansion of the former North Hills Mall into a vibrant mixed-use town center in Raleigh, N.C.; Metropica, the 4 million-square-foot transit-oriented mixed-use complex under construction in Sunrise, Fla.; and the conversion of a former boys' school in Cranston, R.I., into Chapel View, which incorporated national retailers and restaurants, office space, and luxury condominiums into historic structures including a stone chapel. "CI is more than an architecture firm; its master planning and initial approaches to creating exciting projects are exceptional," Marcozzi said. "I'm excited to bring my previous experience, including a family background in construction, to these and new projects around the country." Marcozzi earned a Bachelor of Architecture degree from the University of North Carolina at Charlotte. He is an associate member of the American Institute of Architects, and is a member of the Urban Land Institute, International Council of Shopping Centers, Italian American Civic Club of Maryland, and the Main Street Design Review Team of the SECDC. He lives in Baltimore with his wife Mariagrazia Parravano-Marcozzi and their son and daughter. The CI Design team served as planner & architect for North Hills in Raleigh, NC, a 2-million square-foot mixed-use development. CI Design is currently working on several mixed-use developments including Metropica in Sunrise FL, a 4-million square-foot development and the 1.2 million square-foot expansion to North Hills In Raleigh, NC. CI Design is headquartered in Baltimore, MD, and has offices in Boston.